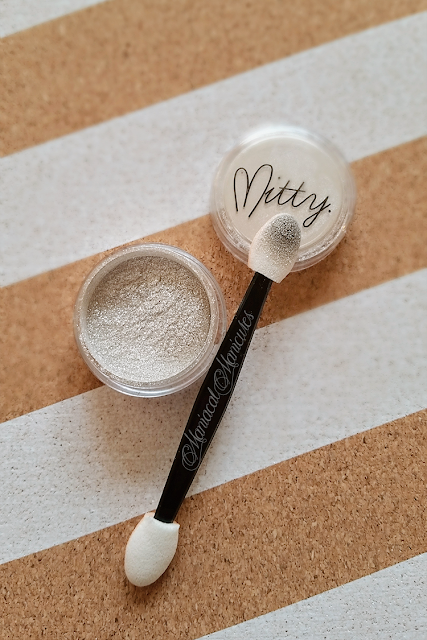 First I have to start off by saying, "Mitty Chrome Powder, where have you been all my life?" I had been eyeing chrome nail art for over a year, hesitantly scrutinizing different brands' incarnations and not very impressed by most. My hesitation was largely due to my having no gel polish supplies. None. Nada. Zip. Yes, it made me cry sometimes inside too. But then as a belated birthday to myself this year I bought my first Madam Glam polishes and the MelodySusie Portable 24W LED Lamp Light Acrylic Nail Dryer from Amazon. Yes, the one Emily from Very Emily reviewed and it was on my wishlist tout de suite. 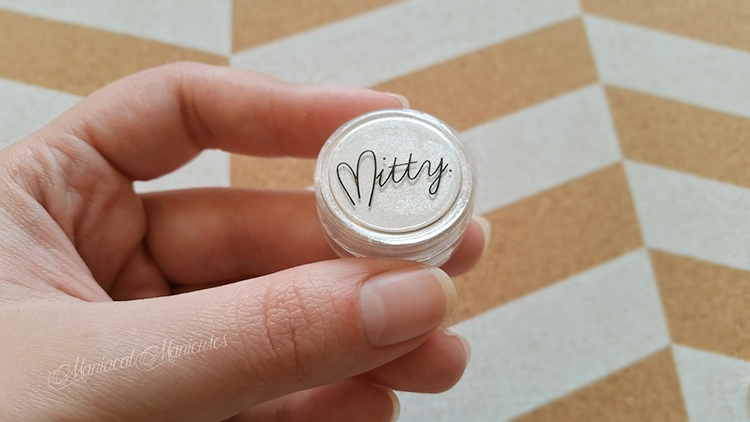 Once I had my order confirmation email from Madam Glam, I ordered Mitty Chrome Powder in silver and awaited impatiently with wiggling tail (in spirit, as the only one with a tail here is my dog). 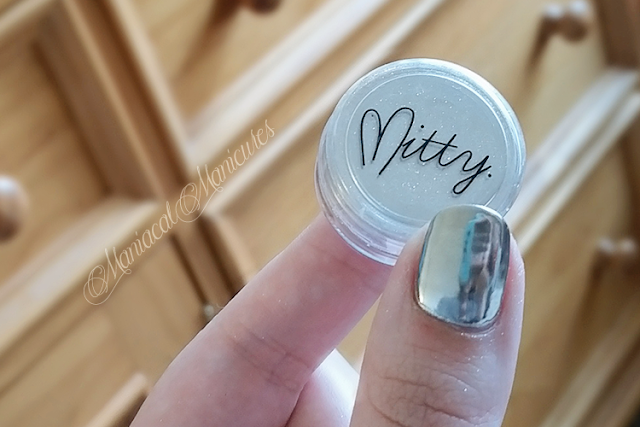 I also had ordered mani-tape from Mitty because I wanted to try its efficacy in comparison with my Bliss Kiss Liquid Latex. Okay, I have to say, for long-process manicures that include stamping, watermarbling, layers, etc. the mani-tapes are fabulous! While I find them reasonably priced, it would be expensive to use them for every manicure (well, when painting nails more than once a week). Instead I opt to use them for any intensive designs to avoid having to reapply latex over and over. They are definitely sticky, so I recommend tweezers and patience when applying. But they are so worth it! I started by cleaning up my nails and cuticles, lightly sanding the surface of my nails and wiping them with rubbing alcohol to remove any oils or residue. 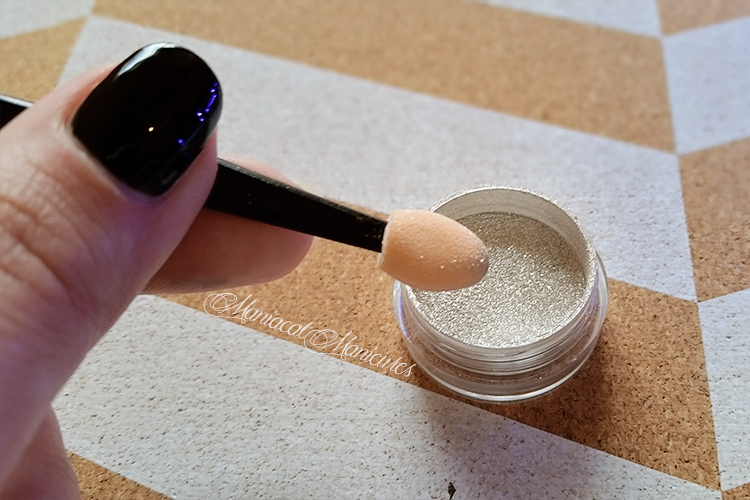 I then applied a thin layer of Madam Glam Base Coat Gel and cured it in my MelodySusie Portable 24W LED Lamp for 30 seconds. I then applied one thin coat of Madam Glam "Perfect Black" Gel Polish, curing it in the LED lamp for 30 seconds; repeating this process with a second coat. Next, I applied one thin coat of Madam Glam "No Wipe Top Coat" Gel and cured it for 30 seconds. I then used the provided applicator that came with the Mitty Chrome Powder to apply and rub the chrome powder until the desired finish was reached. 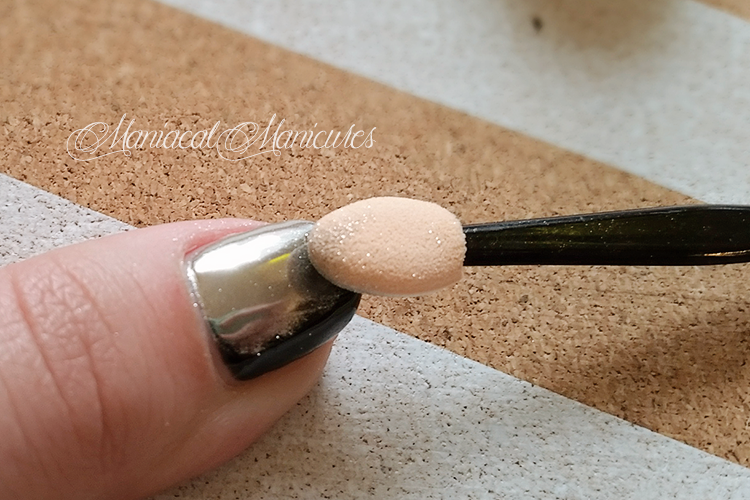 Then ONE FINGER AT A TIME I applied another thin coat of Madam Glam "No Wipe Top Coat" Gel and cured it for 30 seconds. The reason you want to do this one finger at a time is because the longer you wait to cure the last topcoat, cloudiness can occur, thus affecting the look of the chrome. Now just look at that shine (you can totally see my reflection)! Madam Glam can be found on Facebook, Twitter, Instagram, Pinterest, and their Website, as well as many international stocklists. Mitty can be found on Facebook, Instagram, Pinterest, Whats Up Nails, and their Website. MelodySusie can be found on Facebook, Twitter, Instagram, Pinterest, Google+, Amazon, Blogspot, and their Website. I had only seen reviews of *press samples* which I take with a large dose of salt. I'm so glad I found a review that wasn't a sample sent to the blogger. Thank you so much for this. I'm so glad I could help! I definitely here ya about press samples. I follow a number of bloggers who I count on to have honest reviews. Though I can understand how some bloggers may feel pressured to always have a strong positive spin for fear of hurting their relationship with brands. 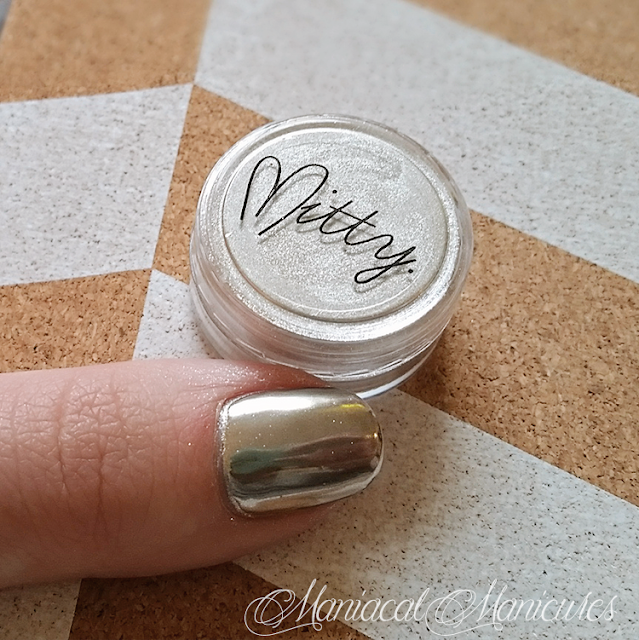 I kept seeing variations of chrome powders but Mitty was the "chromiest" I'd seen, so I ventured to take a risk. I've been very happy with its results consistently. I still have not yet tried their other colors, and am not sure since I've seen less true-chrome like swatches of them, but I'll keep my eyes open. Whats Up Nails has some incredible multichrome powders as well.